A couple of days ago, my husband said, “We should have someone over tonight.” Our house was relatively clean, I had just bought a few pounds of ground beef on sale, and it had been a long time since we had gotten together with the neighbors on our cul-de-sac. Why not invite a couple of families over for chili? Chili is one of my go-to meals to fix when families with kids are coming over for dinner. All it takes is browning ground beef, opening some cans, and throwing in some spices. I either put it in a slow cooker to cook all afternoon or wait until closer to time and cook it in my Instant Pot. I serve it with a bag of tortilla chips and cheese, and dinner is done. When it comes to inviting people over last-minute, nothing beats having 1-2 meals that you can rely on regularly. Your Recipe Besties, if you will. Today I’m going to share with you 3 qualities of the perfect go-to meal for easy entertaining. That way, the next time you want to invite someone over on the spur of the moment, you’ll already have a game plan. 1. You should know your go-to recipe almost by heart. Your grandma’s lasagna. That grilled chicken that’s in your weekly meal rotation. The sloppy joes your kids beg you to make. You want to pick a meal that you’re known for and that you know so well that you could cook it with your eyes closed. Do you have a couple of recipes in mind? For me, it’s chili and a Mexican food bar. I can pull those off with hardly any advance notice, and they’re always a win with both adults and kids. 2. Your go-to recipe should be simple. If you’re hosting last-minute, you don’t want your go-to recipe to be complicated. You want it to be easy in some way. Maybe the ingredients don’t take a lot of chopping or the prep work is simple. I already described how easy chili is for me to fix. For a Mexican food bar, all I have to do is cook some meat in my Instant Pot and make some salsa and guacamole — all of the other ingredients are easy to cut up and put into bowls. A lot of times, my guests offer to bring something, and I let them bring a few of the toppings. When you keep things simple, you have a lot more brain space for interacting with your guests. 3. Your go-to recipe should give you some hands-off time. You want your go-to meal to give you some hands-off time so you can prepare a side, make a dessert, or do some last-minute cleaning. A make-ahead pasta dish or casserole that cooks in the oven for 30 minutes to an hour gives you plenty of time to toss a salad and butter some bread. A soup cooking in the slow cooker all day means you can wait until your guests arrive to open the pot, leaving you time to set the table and sweep your floor one last time. A chicken dish cooking in the Instant Pot gives you time to make some brownies or cookies to go along with the meal. 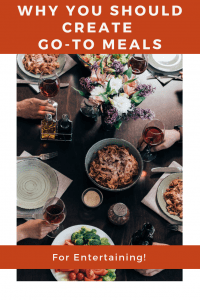 If you’re wanting to become more spontaneous with your dinner invites, having a couple of go-to recipes will make inviting people over easy. Just choose recipes that you know super well, that are simple, and that give you some hands-off time to finish any last-minute preparations for your guests. 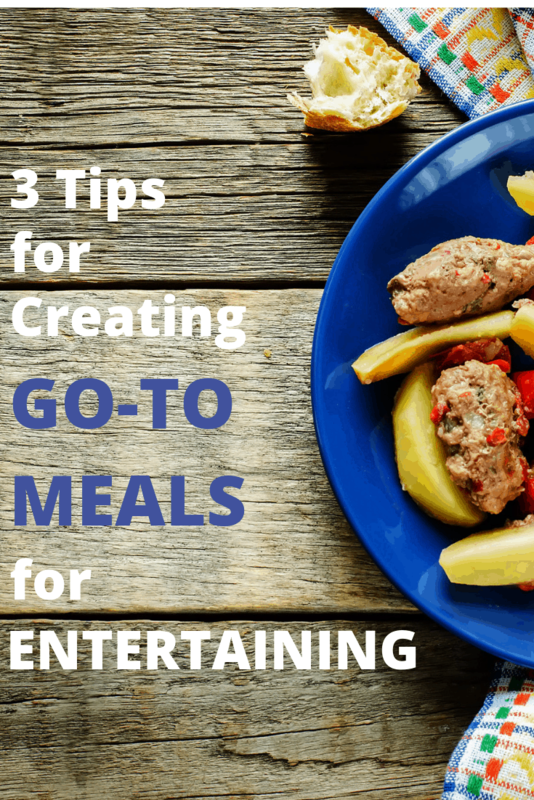 Do you have a go-to recipe for easy, spontaneous entertaining? Share in the comments! I live on a sheep farm, so if I have a few hours notice a roast lamb would be my first choice. We don’t have as many roast meals as we did when all the kids still lived at home, so a roast is a treat. If I have to make it quickly then home-made hamburgers are another stand by. We have one regular visitor who always asks for the rich, meaty vegetable soup that I make in winter. It sits on the wood burner fire all day and slowly bubbles. The flavour gets better and better the longer you leave it.